The completion of the Rolling Hills wind project in Iowa marks a significant milestone for Mortenson Construction, with Rolling Hills being its 100th wind power project. Rolling Hills also added a whopping 443.9 MW of wind power to MidAmerican Energy's renewable portfolio. The Rolling Hills wind project in Iowa was significant for a number of reasons. In addition to it being Mortenson Construction's 100th wind project, Rolling Hills is also the largest single-phase wind project the company has constructed—ever. 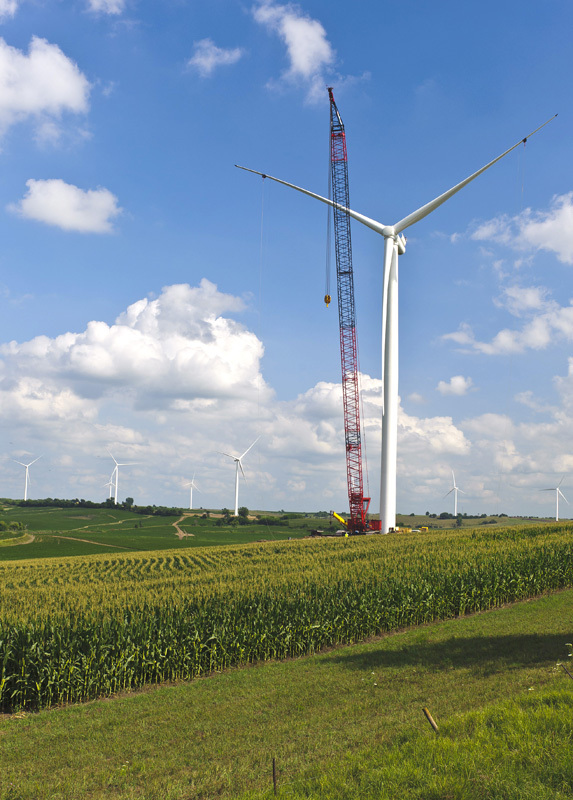 In 1995, Mortenson installed its first wind project in Adair, Iowa. Little did the company know then that several years later, it would install a project more than twice that size, just down the road. Tim Maag, vice president and general manager of Mortenson's U.S. wind business, says the massive 193 turbine, 443.9-megawatt Rolling Hills wind project has been a success on many levels. Not only is it a great accomplishment for the company, but it also created jobs and generated revenue for the local community. Mortenson was selected by major utility MidAmerican Energy Company through a competitive tender process to construct the wind project and to install access roads, underground electrical collection systems, and internal tower wiring. The company immediately got busy completing engineering work and procuring materials. By the end of April 2011, Mortenson was setting up on the site and installing work trailers and the construction lay-down area. By mid-May, construction began in earnest. In three months, the wind farm was beginning to produce energy, and by the end of 2011, Rolling Hills was fully commissioned and on-line. To get a wind farm of this size completed and operating in less than a year speaks to the strong relationship between MidAmerican Energy and Mortenson, as well as Mortenson's relationships with manufacturers and contractors. "We've built 17 projects in Iowa," says Maag. "And Rolling Hills was the sixth project we've built for Mid-American Energy, so there was really no learning curve in terms of working with MidAmerican." True to its name, the terrain on the Rolling Hills project is very hilly, so it required a lot of breaking down cranes to get from one site to the next. All of the foundations had to be buoyant to withstand a very wet environment. The choice of Siemens turbines, Maag says, was in part due to the fact that certain components were manufactured in Iowa. 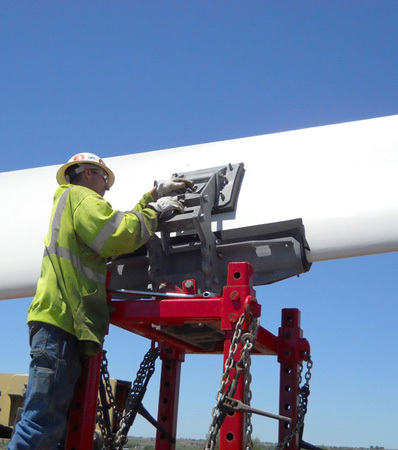 The enormous blades—half the length of a football field and 12 tons each—were manufactured at Siemens' blade manufacturing plant in Fort Madison, Iowa. A total of 193 Siemens 2.3 MW wind turbines were used on the Rolling Hills project. Coincidentally, Siemens had supplied 76 of its 2.3 MW wind turbines for the Adair wind project, down the road. So Mortenson was more than familiar with Siemens turbines. In fact, including Rolling Hills, they have installed approximately 340 Siemens turbines to date with another 138 to be erected by spring for projects currently under construction. "Again, we have a great working relationship with Siemens," says Maag. "Overall, it was an efficient process. The landowners also helped move the project along. We had several meetings to keep them informed of the construction progress, where our traffic would be routed, and how it would be coordinated with their farming activities," says Maag. "The individuals we dealt with were absolutely great—very interested in the project and easy to work with." There are always challenges with wind power projects, especially with a project of this magnitude. One of the biggest obstacles was obvious from the name—Rolling Hills. "The terrain was very hilly, so it required a lot of breaking down cranes to get from one site to the next," says Maag. "The wind was an issue, which we battled pretty much all summer long. "Also, all of the foundations were buoyant, meaning they were built to withstand a very wet environment. The ground can be completely saturated, and the foundations are large enough to handle it," explains Maag. Mortenson Construction is very familiar with Siemens turbines. Including Rolling Hills, they have installed approximately 340 Siemens turbines, with another 138 to be erected for projects currently under construction. Each foundation for the 80-meter tall turbines required 500 to 600 cubic yards of concrete. When erection began in July, Mortenson averaged two turbines per day, using Manitowoc cranes and several Grove rough-terrain cranes. "We were frequently shut down by the wind, so when the winds were down, we worked very long days, sometimes erecting three or four wind turbines in a day and other days as little as one or two because we had to move the crane," says Maag. At the peak of construction, there were more than 300 employees on site. "We had around 150 Mortenson employees, and the rest were subcontracted employees. Most of the workers were union and locals living within a 90-mile radius of the project site." The crew had its work cut out for them. In addition to erecting the 193 turbines, Mortenson constructed 37 miles of access roads and 139 miles of underground electrical collection cable at the Rolling Hills wind project. "While we performed nearly 50 percent of the labor with our own craftworkers, subcontractors, such as Rachael Contracting out of Minneapolis, also provided craftworkers to help build access roads," says Maag. "We also hired JF Edwards Construction as the electrical collection subcontractor and Century Engineering to do the tower wiring." The Rolling Hills wind project was designed and built for MidAmerican Energy. MidAmerican Energy isn't just a big player in the energy industry; it's Iowa's largest energy company, providing electrical service to 729,000 customers and natural gas service to 709,000 customers in Iowa, Illinois, Nebraska, and South Dakota. MidAmerican Energy ranks as the No. 1 rate-regulated utility in the U.S. in terms of ownership of wind-powered capacity. In 2011, the 443.9-megawatt Rolling Hills project, located in Adair, Adams, and Cass counties, was one of three MidAmerican Energy wind projects constructed in Iowa. An additional 13 wind turbines were constructed in Pocahontas and Calhoun counties, and 52 wind turbines were constructed in Marshall County—all by Mortenson. 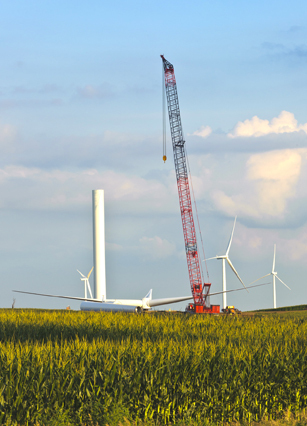 Once completed, the 258-wind-turbine expansion project added 593.4 megawatts of renewable energy to MidAmerican Energy's generation portfolio, enough capacity to power approximately 190,000 average U.S. homes. All this activity had a positive impact on small communities, such as Massena, Iowa. Massena is located in the heart of the Rolling Hills wind project. The choice of Siemens turbines on the Rolling Hills project was in part due to the fact that certain components were manufactured in Iowa. 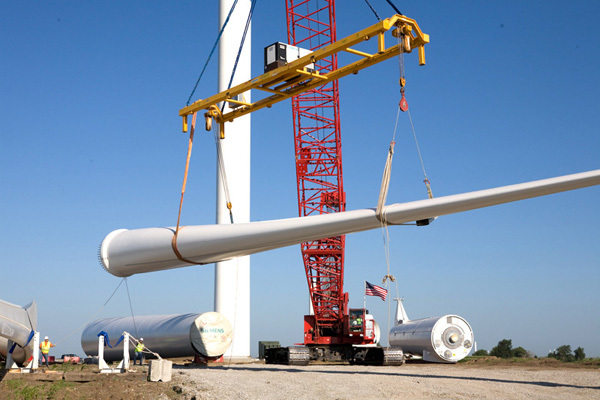 The enormous blades—half the length of a football field and 12 tons each—were manufactured at Siemens' blade manufacturing plant in Fort Madison, Iowa. Not only did construction crews fill the local restaurants, Mortenson also used local suppliers to purchase a variety of supplies. "We also used a lot of the same equipment the local farmers do, and we used local mechanics to fix tires and help keep our equipment running," Maag explains. "It was a huge boost to the local economy, not to mention the fact that the turbines are going to be there for many years to come." It's not all about economic benefit though. Mortenson gave back to the community in other ways. "One of the things we do is partner with the local fire department in the area. 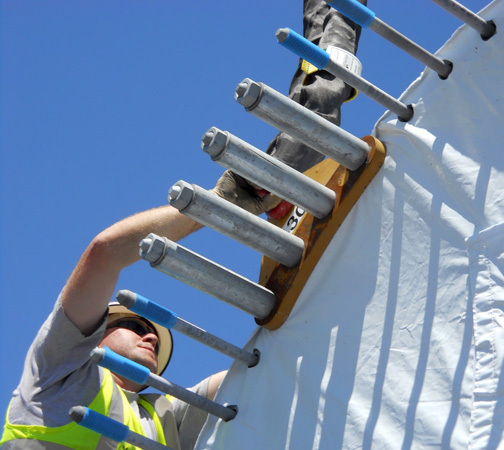 Together, we do tower rescue training to make sure they are prepared for an emergency. We also presented our Catch the Wind program to local schools, which is designed to help educate children about renewable energy," explains Maag. Rolling Hills significantly added to Iowa's already robust wind energy portfolio. As of the end of 2011, Iowa had 4,322 MW of wind power, ranking it #2 in the U.S., after only Texas. With the completion of the project and several new projects underway, Maag is looking ahead to the future of the wind industry and is encouraged by the advances he is seeing in technology. "It's amazing that a 2-megawatt turbine can provide power for 400 to 600 homes. Now there are turbines as large as 3 megawatts and growing. It's truly impressive how much energy a single turbine can produce now because of the technology, even with low wind environments. Undoubtedly, wind power will continue to be a significant part of the U.S. energy market in the years ahead." Fifteen years from now, Maag believes wind turbines will be generating an enormous amount of power. He can easily see a single turbine in the future replacing two or three of the turbines installed today. In fact, Mortenson already is replacing turbines installed years ago. "When we work on the west coast, we are doing some repowering of projects where we'll take down existing turbines and replace them with newer, more powerful turbines. We're starting to do some of that for projects that are 15 to 20-plus years old in California," says Maag. With a project the size of Rolling Hills under their belt and with more than 100 wind projects now completed, it's hard not to feel some pride in a well-run company. Mortenson, a family owned business, is the 19th largest construction company in the U.S., with revenues of approximately $2.5 billion. According to Engineering News Record (ENR), Mortenson is ranked as the second largest wind contractor in the U.S.
"ENR recognizes Mortenson as the only power contractor that dedicates 100 percent of its power industry to the renewables business," says Maag. "When you see others that are ranked in the power industry, they might do fossil, they might do nuclear, they might do various types of energy. We focus solely on renewables—primarily wind and solar, with some geothermal and hydroelectric. "We welcome the opportunity for more projects in the future," says Maag.